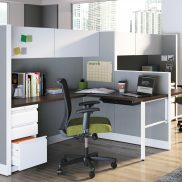 Rental cubicles and open plan benching systems are available in a large variety of sizes, styles, colors, and finishes, so your Chicago business is sure to find what you need. Our dedicated staff will help meet your office’s logistical and space features and limitations, while adhering to your personal tastes and the decorum of the business. At Arthur P. O’Hara, we will partner you with the entire process to make sure your rental desks fit your style, all at prices you can afford. Call 630-786-5454 today to find out how the furniture experts at Arthur P. O’Hara can help fill your work stations with rental desks from our expansive Downers Grove warehouse.